The first Metro Board meeting of 2018 is now in the books. Here is the official recap of actions and you can listen here. •Adopted the “Twenty-Eight by ’28” plan to complete 28 major road, transit and bicycle projects before the 2028 Summer Olympics and Paralympics in the Los Angeles area. Source post. The idea — a good one, I think — is to use the Olympics as a milepost to finish projects that would serve the public well before, during and after the games. 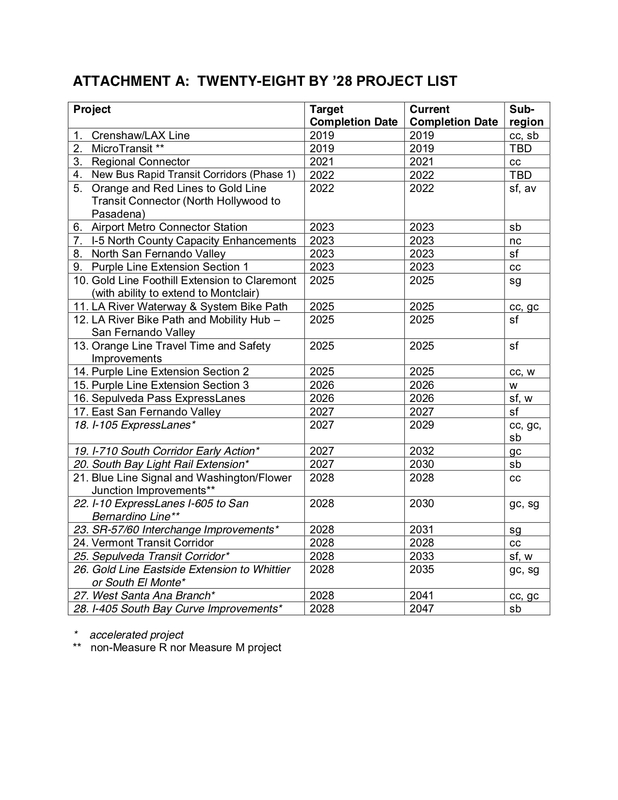 Of the projects listed, 17 are already scheduled to be complete by 2028, eight have schedules that are “aspirational” and three would need new resources. In other words, funds would need to be accelerated or found for 11 of the projects. That’s always a challenge when it comes to transportation funding, but as I’ve written in the past, the funding that does come available is to the agencies or projects that have solid plans. Below is the project list, map and a presentation on the plan. •Metro CEO Phil Washington during his report to the Board (begins at 15:06 mark of audio) commented briefly on the video taken on the subway earlier this week of an encounter between an LAPD officer and a young woman. “I can say a lot about this incident but I won’t because I want to respect the investigation underway,” Washington said. Several Board Members also spoke about the incident. Inglewood Mayor James T. Butts — a former police chief — said the LAPD officer did an excellent job in a difficult situation and that the officer should not be pre-judged. “You will never have a [transit] system that you want if these officers are put in impossible situations,” Butts said. That mirrors the response I’ve seen across Metro’s blog and social media, as well as comments on media articles. Some people want greater enforcement of the rules, others say enforcement is fine but situations can’t be allowed to escalate. •Approved a motion asking Metro and Metrolink to develop a fare discount program to boost ridership on the San Bernardino Line. •Approved two advertising contracts. The first is a 10-year contract with Outfront media to place advertising on the Metro Bus system with a guarantee of at least $262.2 million in revenues for Metro. The other is a 10-year contract with Intersection Parent, Inc. to place advertising on the Metro Rail system with a guarantee of $42.9 million in revenues for Metro. This new digital technology will include interactive screens to display customer information, system and neighborhood maps, vehicle arrival information, service alerts and disruptions, and other agency information. Some of the displays will also provide customer amenities such as free Wi-Fi, free 911 emergency calls and other calls nationwide, USB charging stations, and neighborhood and city information on an interactive tablet. •Approved exclusive negotiating agreements on joint developments at Mariachi Plaza and at Cesar Chavez and Fickett. Source post. •Approved the Supportive Transit Parking Master Plan, which includes policy on parking fees. Source post. any chance the artesia line gets accelerated? last time table i saw listed 2044 as the date it connects to union station. understand that its lack of proximity to olympic sites make it unattractive, however lack of north south options seems an issue with current system. coming from huntington park its a shame that long beach is the more accessible destination rather than dtla considering the distance. Huh? 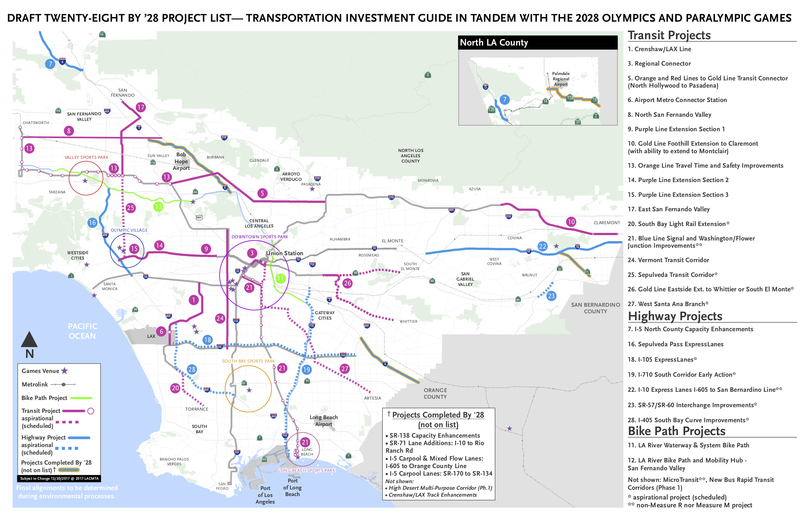 Little confused here, as currently the Santa Ana Corridor is actually on the list for a target 2028 date. Though I do wonder if that only means only the south leg would be built. Dave, the plan is to complete the entire line, including the northern portion down Alameda to LAUS, by 2028. According to Garcetti, anyway. Hi Steve. I sent you a tweet earlier this month regarding if the Willowbrook/Rosa Parks station will FINALLY acquire a Lynwood Trolley stop signage for the Lynwood Breeze. ¿Have you found out the answer? any news on the 177? Love the new digital signs. The only things that give me the sads is that the mock up sign at 7th and Metro has the Red Line running at the same miserable headways. Will we ever have 15 trains an hour. Need the Purple Line extension to be completed. Right now the turnaround at Union Station can’t accommodate anymore trains, but the new one will be able to. I agree 100% with Matt, the Purple Line extension should be priority #1. Hey Steve, the embedded audio or video link to the board meeting seems to be broken. Ugh. Will check it out. Worked the other day. Seems temperamental lately, sometimes works on one browser for me but not others. Which browser you on? I have troubles with Chrome but Safari usually works.